First off, Happy (Canadian) Thanksgiving! I've had a nice, low-key weekend so far full of friends, family, and lots of food. Especially after all the non-stop work travel, it's been nice to power down for a few days. 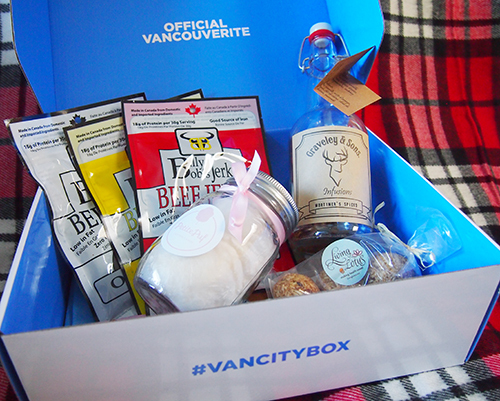 A special c/o delivery also recently showed up on my doorstep to keep me entertained over the holiday weekend... a new subscription box called the Vancity Box. If you've ever visited my Instagram or this blog category before, you already know how much I love living in Vancouver, so it should be no surprise when I say that the idea of getting my "city in a box" is kind of a dream come true. The box is tailored specifically for locals and features items from local brands and companies. Inside the October box were a ton of edibles (my fave), including cotton candy from Petite Puf, three types of beef jerky from Billy Bob's Jerky and vanilla macaroons from Living Lotus. I love the focus on organic and healthy with these choices, and I ate most of them within the first few days of receiving my Vancity Box. What can I say? I love snacks. In addition to the food items, I received a Graveley & Sons Alcohol Infusion Kit to make my own Mortimer's Spiced Rum. Vancouver is home to numerous craft breweries, distilleries, and artisanal cocktail bars, so this kit could not be more relevant (especially because the company is based in East Vancouver where many of those places are located). I really like rum so I'm excited to try infusing my own! 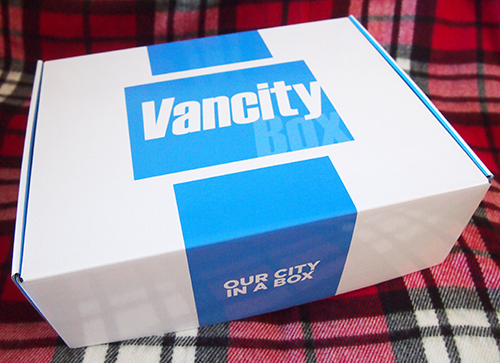 The VanCity Box is only available for addresses in British Columbia and costs $34.99 CAD/month (with savings if you subscribe for 6 or 12 months). It's on the pricier side as far as subscription boxes go but it's a great way to support local businesses and would make a good gift for a fellow Vancouverite. vanilla macaroons are quite possibly my fav thing in the whole world. YUM! Ummmmm seriously I need this in my life!! it's never too late to sign up! Our November deadline just passed but you can sign up for December. Whoooaa this is so cool! Definitely pricier but would be such a fun gift to receive. Isn't it? I can think of so many people who would love to receive something like this as a present. This is so great! It sounds like the perfect gift to give! Very Hipster this box. Like the idea of the surprise. This would make a great wedding gift! It would make a good Christmas present too!